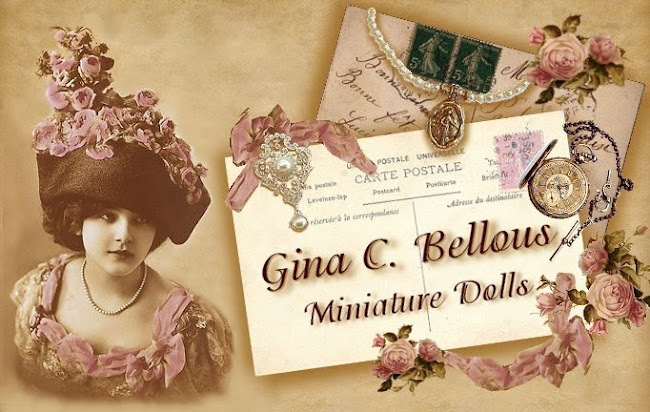 Gina C. Bellous Miniature Dolls: It's First Give-away Time! Okay, I have decided to have the first "Give-away" on my blog. I will start with smaller items for doll making and as the followers grow so will the value of the prize! The first give-away is for some fantastic Antique Lace. It will be for 3 yds of 3 different antique laces. Some of them are French. They are valued at $4.00 - $6.00 per yard (if you can even find any for sale). That is a total value of $42.00 in lace, not bad for a first time give away. They are very fine cotton. This should be enough to create a lovely doll or more. Rules below. First: You need to make sure you are a follower on my blog (click "follow" if you haven't already). Secondly: You just need to comment on this post telling me that you are indeed interested in being in the contest, and what your miniature interests are and what you would do with the lace if you won! That's it. You only need to comment once and I will take all of the names of the entrants and have someone in my family pull the lucky winners name! The Contest will close the end of next week at 9:00 pm Pacific time! Good luck everyone and don't forget to tell your friends! Oh, I just LOVE laces! And they are so rare over where I live. It is so pretty give-away, Gina! And generous too! Please count ma in! Hola Gina, que preciosos encajes sorteas! me encantaría ganarlos. Haría con ellos ropa para bebé o tal vez una colcha. Beautiful laces! 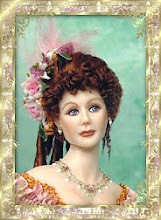 I would love to win them:-) I dress miniature dolls mostly in fancy ballgowns of the Victorian time period. Hi Gina..Thank you for holding a giveaway. The lace is beautiful and can be used in so many different ways. I would love to win, I would use the lace for table settings, doilies, blanket ruffles and little girl dress trim. Good luck to everyone! Gina, What a wonderful giveaway! I LOVE lace. I would use it to dress a baby in the Victorian era and to maybe embellish a cradle also! I will keep my fingers crossed!! Lovely, lovely giveaway. I would probably use the lace to make ruffle skirts for my girl dolls. It might be suitable for window treatments too. I have this idea of very lacy curtains, but I have not found a suitable lace just yet. Que bonitos son los encajes,yo lo usaria para mis trajes de las muñecas,los moises,las cortinas y muchas cosas mas.Asi que con tu permiso me apunto a tu sorteo y decirte que tambien estoy de sorteo en mi blog por si quieres apuntarte,tienes cosas muy lindas.Auxi. Hello Gina, I like to participate in this give away. 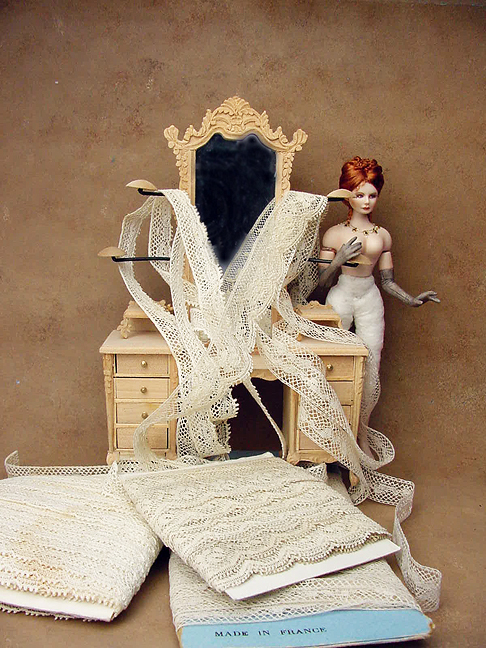 I like making and clothing dolls , but I also making a French house so I could use the French lace very good, for the soft funishing of the house. Such fun!!!! Count me in! Cotton LACE!!!LACE! LACE! LACE!!!!! YEAY! LOL! Okay so here is the list of things that could be made with this beautiful lace. OOPS! Might be running out of lace at this point...lol! What a lovely laces, thank U for this giveaway. I would use them for making my little people clothing. These laces are wonderful. Please, count me in your giveaway. I put the link on my blog. I could use them for pillows, clothes, curtain and more. Mi debilidad son los encajes. Estaría feliz de ser la afortuna, tengo en proyecto hacer una mercería, así que sería estupendo ganarlo. Yo también estoy de sorteo, quedas invitada. Pongo el anuncio en mi blog. Z radością zapisuję się na listę. Jeśli wygram zrobię wreszcie ubranka mojemu miniaturowemu dzidziusiowi. Chciałabym też zrobić kilka innych miniaturowych rzeczy. Uściski! With joy writes itself to the list. If I win I'll finally my miniature baby clothes. I would also like to do a few other tiny things. Hugs! ¡¡Wonderful!! Para vestiditos de damas son finisimos y elegantes. Me encantaria poder participar en tu sorteo. Gracias. Divino! Si puedes apuntarme seria muy feliz. Beautiful laces. I really would like to win those. I think I would like to try to make some bedding/sheets which have been going in the family from mother to daughter for some time, sort of a heirloom. Or perhaps I might try to make some dolls and clothes for them. I'd LOVE to enter your lovely giveaway- so I do hope you count me in. IF I would win this... Hmmm, I think I would wanna try to make some clothes for ladies from those beautiful laces or maybe some beddings.. I'll put a link to my blog's sidebar. Hola, qué regalo tan generoso!!!. Me encanta tu blog. Me gustaría participar y si ganara seguramente lo usaria para una colcha, o para varias si alcanzara. Saludos y felicidades por tus seguidores. Hola Gina, me gustaria participar en tu sorteo, lo pongo en mmi blog ahora, si ganara ya no tendria excusa para empezar a hacer vestidos y juegos de cama, besos. Just found your blog today, your dolls are wonderful. At the moment I mainly make furniture in 1/12 scale. I used to make full size porcelain dolls more than 10 years ago. I still have my kiln, so would love to make mini dolls sometime in the future. Oooohhh apuntameee, me servirian para adornar los vestidos de vistiendo sueños!!!!! Certainly I want to participate in this contest, especially for such a lovely lace! Of this beautiful lace I would make beautiful lingerie or a beautiful dress. Hi, I am new follower but not new in the dolls' world. Actually I work with my miniature doll house 1:12 and love my Barbie dolls collection. I love to collect Antique Lace, fabrics and sew new dresses to my dolls. Antique Lace are the most wanted thing to sew old fashioned pillows to my little house and sew new romantic style doll's dresses. Hola, me gusta mucho el papel y coser, y lo usaría para algún vestido guapo. Wonderful giveaway. I want to win this lace for the clothes I want to make for my dolls. I put a link to my blog. Thank you. Maravilloso sorteo, me vendria genial para mis vestidos para los bebés... es precioso. Soy seguidora tuya y ahora mismo subo el anuncio en mi blog. Espero que cuentes conmigo para el sorteo. Un abrazo. Teresa. Hola Gina, me encantaria participar,lo mio son los encajes, me vuelven loca, y seguro que realizaría un nuevo modelo de colcha, gracias por tu sorteo, lo aviso en mi blog. Ciao Gina, piacere di conoscerti!! E' un giveaway fantastico e molto generoso!! vorrei partecipare e se dovessi vincere utilizzerei tutti questi merletti per rifinire i miei asciugamani ricamati e realizzerei un bellissimo abito per questa elegante signora, che potrebbe vivere comodamente nella mia nuova casa vittoriana. E' un sogno !!! spero proprio di vincere e nel frattempo metto il link sul mio blog. Es un regalo maravilloso, lleno de posibilidades para hacer cualquier trabajo en una casita de muñecas. Yours is a very generous giveaway. I am always looking out for lace, especially dollhouse sized which are very difficult to find here. If I win (fingered crossed) I'll use them for my miniature rooms scenes. Please count me in. Hi Gina, I am madly in love with the miniatures because I think I may live in another era and another place. These antique lace are amazing hopefully allow me to participate, I would do with them is a beautiful dress for a doll dress that I have not yet, I hope to get lucky. How generous of you to give away some of your beautiful lace. I would love to win it and use it in dressing one of my dolls. Following!! When are you going to sell your molds again? Podria participar en tu sorteo!!!! tu regalo es precioso.